You are here: Home / Uncategorized / The Happy Healthy Mama Newsletter and FREE Ebook is here! The Happy Healthy Mama Newsletter and FREE Ebook is here! Personal stories from the week. I’ll share anecdotes from my week that I don’t always have the opportunity to share in my blog posts. Tips, tricks, and recommendations. I’ll share tidbits from my kitchen–from cooking tips to time-saving tricks. Healthy lifestyle inspiration. You’ll learn about things I do to make my life (an my family’s life) as healthy as I can! Videos! I will occasionally share videos showing how I do certain tasks, quick recipes, or encouragement. These videos will be for subscribers only and I won’t be sharing them on the blog. Links to my most recent blog posts. I’ll always show you what I’ve published for the week so you won’t miss anything. As a big THANK YOU for signing up for my newsletter, I’m offering you a FREE ebook, The Top Ten Healthy No-Bake Snack Recipes! This ebook puts my family’s favorite, easy, no-bake snacks, each one with a full color photo, in one place for your easy access! Every recipe in this book takes 15 minutes or less. You can either save it on your computer or print it out if you like having a paper copy of recipes in front of you. Use this form to sign up and once you confirm your email address, you’ll get the Top Ten Healthy No-Bake Snack recipes ebook straight to your inbox to download! 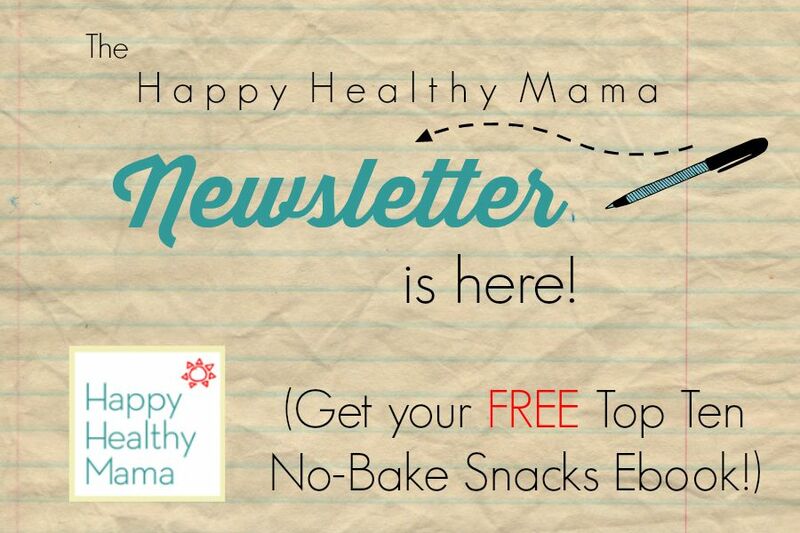 Sign up for Happy Healthy Mama’s Newsletter and get the FREE ebook, Top Ten Healthy No-Bake Snack Recipes! If you don’t have time to sign up right now, no worries. There will be a sign-up form in my side bar for you to enter your email address at your convenience. If you are already a subscriber, you’ll be getting a special email with the ebook very soon, so be looking for it in your inbox! This will be the last week that I keep my rss feed emails on, so you won’t be getting those plus the newsletters. It will only be the newsletter from next week on. I’m excited about this change and I hope you all enjoy my newsletter as much as I’ve enjoyed planning it! How does one download this book (stupid me) I can’t work it out. I already get you emails, do I have to subscribe to the newsletter as well? No, you don’t have to subscribe again! I’ll be sending out the ebook to those who are already subscribed tomorrow. I just knew you’d already be getting an email with this blog post today, so I wanted to wait so as to not send 2 emails in one day. 🙂 You’ll get it soon, though! Every mom will surely love this! Healthy mama ebook is one way that can help them in giving a healthy lifestyle to their kids. Hi, I subscribed a couple days ago but havent gotten the download yet.